This race is a crewed or self-supported race. We will have 8 (formerly 7) well-placed and staffed aid stations along the course. Self-supported runners will be able to utilize these for drop bags. These Full Service Aid stations will have water, sports drinks and some basic ultra staple items. 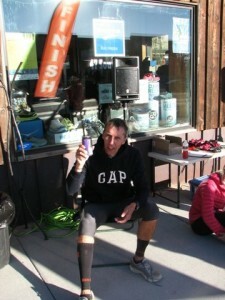 The Water Only aid stations will simply have a water jug. Below is updated information on aid station locations and what will be offered. Please read the race rules carefully. Safety of runners and crews on the course is our number one priority. All full service aid stations will be staffed with Volunteers. These stations will provide water and Hammer Heed sports drink (except the Water Only stops) as well as a variety of ultra foods, which will include: chips, pretzels, salty foods, bars, bananas and oranges. There will be some sweets/sugary items and gels available as well. All participants must check in with the Volunteers when passing the Full Service Aid Stations. Click HERE for exact locations of each aid station on the 100 Mile course. Click HERE for exact locations of each aid station on the 50 Mile Course. 1. Mile 15.3 This is located on Hwy 20 near the Valley View Laundry, just after the first Exxon Gas station on the course. There is a convenience store, restaurant and a few other small shops at this location as well. This station will have water, Heed, gels and a small amount of simple food. 2. Mile 24.3: Located on Hwy 20, near the Stage Stop Gas station. This station will have water, Heed, gels and a small amount of simple food. 3. Mile 37.4: This is located at the turn-off to Mesa Falls. Between this location and Henry’s Fork there are a few convenience stores and gas stations scattered along the way. This station will have water, Heed, Coke, Mt. Dew and Sprite, peanut butter and jelly, turkey and cheese roll ups, chips, cookies, oranges and bananas. 4. Mile 50: Located in the Upper Falls parking lot adjacent to the road. There are no other facilities at this location. Approximately 6 miles down the road there are bathroom facilities at the campground by the river. This station will have water, Heed, Coke, Mt. Dew and Sprite, peanut butter and jelly, turkey and cheese roll ups, chips, cookies, oranges and bananas. 5. Mile 60.5: Located at a critical course turn at the intersection of Hwy 47 and county road 4000E. Runners will come into this aid station as they come up out of the Mesa Falls area. There are no facilities or stores until you reach Tetonia at mile 91.5. Crews can detour over to Ashton which is a few miles to the west on Highway 47. This station will have water, Heed, Coke, Mt. Dew, Sprite, chips, cookies, gels and fruit. 6. Mile 70.8: Located in front of the Rough Riders Saloon in the tiny hamlet of Drummond, ID, at the turn from Main St. onto Highway 32. If the bar is open, feel free to grab a cold one! This station will only have water, Heed and gels. 7. Mile 80.9: This aid station is located along the side of Highway 32, at the intersection of County road 500N. No facilities or stores at this location. This station will have water, Heed, Coke, Mt. Dew and Sprite, peanut butter and jelly, turkey and cheese roll ups, chips, cookies, oranges and bananas. 8. Mile 91.4: Located on the left-hand side of the road (Hwy 33), near the North End Grille, in the small town of Tetonia. There is a gas station/convenience store here but please be aware that hours are limited, especially if arriving here during the middle of the night Saturday/early Sunday. This station will have water, Heed, Coke, Mt. Dew, Sprite, gels, chips and some simple foods. We encourage crews to utilize the aid stations to support their runners whenever possible as these are very safe places along the course. Crews may provide support to runners anywhere along the course as long as they follow the safety regulations outlined in the Rules and Regulations. Failure to follow these guidelines will result in disqualification from the race. Runners, you are responsible for the actions of your crew. Everyone’s safety is our number one priority. ALSO: Many runners will be running the race without the support of a crew and relying upon the aid stations only. If you have a crew please encourage them to check on other runners along the way. Let’s all help EVERYONE get it done! DROP BAGS: You may designate drop bags for aid stations 2-6. All drop bags must be clearly labeled with your last name, bib number and appropriate aid station. Runners must provide drop bag(s) at the pre-race meeting Friday night or by 5:00 a.m. Saturday morning. Drop bags will be brought to the finish line as each aid station closes behind the last runner. You may leave items at any aid station during the race and our volunteers will bring them to the finish line after their aid station closes, however, the race and its organizers are not responsible for lost of stolen items.